Though this trail is mostly 4x4 road and two track, it is a spectacular ride for its beauty, adventure and biking. Start at the village of Hatgal and head north along the eastern shore of the lake. Go all the way around the northern tip of the lake and finish on the northwest shore at the bay across from Dulaan Uul (Warm Mountain). Dulaan Uul protrudes out from the western shore to form the bay. At this location you are truly at the ends of the earth just below the Mongolian Siberian border. Along the 145 mile journey (233 km), you will ascend and descend 16 small mountain passes. Only a handful of them are truly difficult, and all 16 add some nice variety to the trip and some really nice DH runs. There is only one supply point along the way. That is the tiny village of Khankh on the NE shore. This is about 100 miles into the trip and is the only point of civilization. Unless you want to ride both directions, it is necessary to have a vehicle pick you up on the NW shore. You can ride this unsupported and have a vehicle pick you up at the end. Or you can ride this supported and enjoy a few of life's comforts each night. There is a ton of opportunity to get off the 4WD road and ride some of the big slopes of short grass. Many have no trail; you just pick your lines and let it rip (backcountry freeriding). There are also various rocks to session on along the way. You can take on as many diversions as you like and extend the trip for as long as you like. After you leave the lower southern portion of the lake, you will likely only see two maybe three nomadic herdsmen families along the way until you get to Khankh. This is a truly remote XC adventure in exceptionally beautiful wilderness. A: I'm guessing you know that once you reach Tsagaan Nuur you are in the middle of the Darkhad Depression and far from the lake. As you proceed south back towards Hatgal, you will reach Renchinlkhumbe Sum. From here, if you have the legs for it at this point (I wouldn't =) ), you can head east and return to Hovsgol Lake by going over Jigleg Pass. This is a big climb and can be muddy, but the scenic rewards are outstanding. After dropping down the pass and reaching the lake, there are trails and two tracks much of the way back to Hatgal. It's about 50km back to Hatgal. You have to use dirt road for a portion of this stretch where all the ger camps are located. A: Sooooo sorry to have missed your post until now. Yes, from the north end of the lake, you can head west and climb over the pass towards Tsagaan Nuur. If I remember correctly, it is about 50km to the top of the pass. I can't remember how far it is from the top of the pass to Tsagaan Nuur. Review: I thought I might add some interesting info about Hovsgol Lake. Here is a paragraph I wrote about the lake a few years ago. Hovsgol Lake, situated in northern Mongolia, is one of 17 ancient lakes of the world. It is thought to be two to five million years old, but could be as old as 20 million years. It formed through tectonic activity, which has created a large rift valley through much of its length. The lake is the most pristine of all the ancient lakes. It is known as the "Blue Pearl of Mongolia". Its water is considered some of the purest in the world and is still potable. The lake extends 137 km in length and up to 40 km in width. It is 262 m (860') deep at its deepest recess and covers 2,620 km2 (1012 mi2). Rugged mountains, extensive old Siberian larch forests, grassy valleys and slopes, and high cliffs grace the lake and its shoreline. Review: This is a special ride that will satiate anyone's sense of adventure ... at least for a while. I give it five stars as a unique XC ride and for all the other biking opportunities along the way. The IMBA difficulty rating system cannot be applied to this trail. 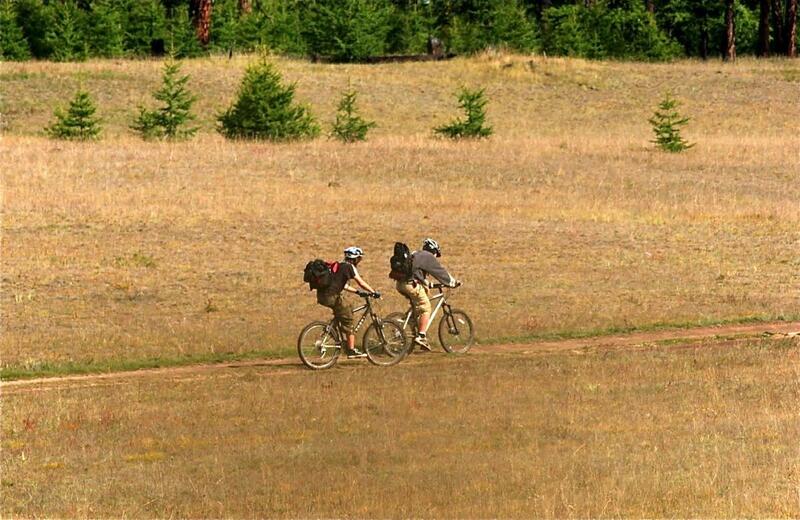 It is an intermediate or advanced trail due to it distance and remoteness in true wilderness. Eastern Shore of Hovsgol Lake MTB Trail 5.00 out of 5 based on 2 ratings. 2 user reviews.